Established in 2009 by the Archives Internationales de Musique Populaire at the Musée d’Ethnographie in Geneva, Le fonds Brăiloiu is an open-access collection of 3028 recordings by the Romanian ethnomusicologist Constantin Brăiloiu (1893–1958) and his colleagues. The collection has also been issued by VDE-Gallo as Collection universelle de musique populaire/The world collection of folk music: Archives Constantin Brăiloiu, 1913–1953, a set of four CDs. 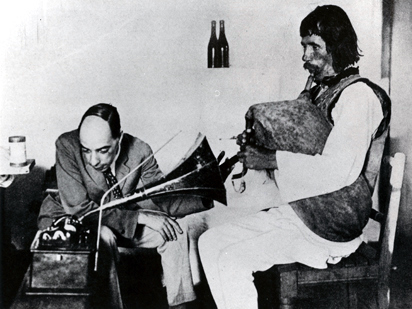 Above, Brăiloiu records Gheorge Musuleac in Romania in 1928. Below, one of Brăiloiu’s 1941 recordings of the Serbian flute player Milan Trandafir. great blog, love it. and this song’s also nice!!!! Thanks–you have an excellent blog too, raising awareness of world music!